Rider Sam Coltherd on board Pookie Pekan (picture by John Smail). 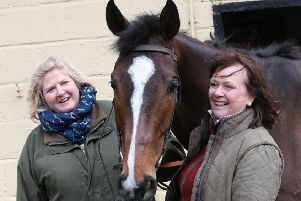 There was double delight for Selkirk trainer Stuart Coltherd at Wetherby last week, when Pookie Pekan romped home to win the Northern Boys Play Crown Green Bowls Handicap Chase. Ridden by Stuart’s 20-year-old son Sam, the five-year-old gelding won by four and a half lengths from the race’s other joint favourite, Cash To Ash, to collect the winner’s purse at odds of 11/4. The victory was jockey Sam Coltherd’s 36th career win. “This was only his second time over jumps,” said trainer Stuart, who also owns Pookie Pekan. Stuart is currently looking for a buyer for this promising young gelding and can be contacted through Coltherd Racing’s official website. 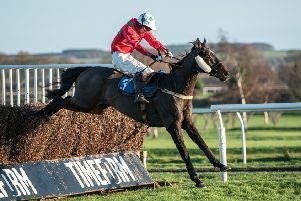 Sam Coltherd notched his second win of the week at Doncaster Races on Saturday, when he won by eight lengths on Chieftan’s Choice in the Bass Tyre Services Handicap Hurdle for trainer Kevin Frost. The victory takes Sam’s career wins total to 37.